While it is true that piano benches make wonderful lounging areas, when not playing, of course, I do have a few favorite places I like to relax. One of my cat trees is pictured below. Burnell made it for me by attaching staggered shelves to a large piece of furniture, in this case a mirrored wardrobe. Pretty cool, eh? You can climb all the way to the top where there are two cat beds for lounging in style. Mostly Jenny prefers the top. She quite often stays there all day, only coming down to eat. 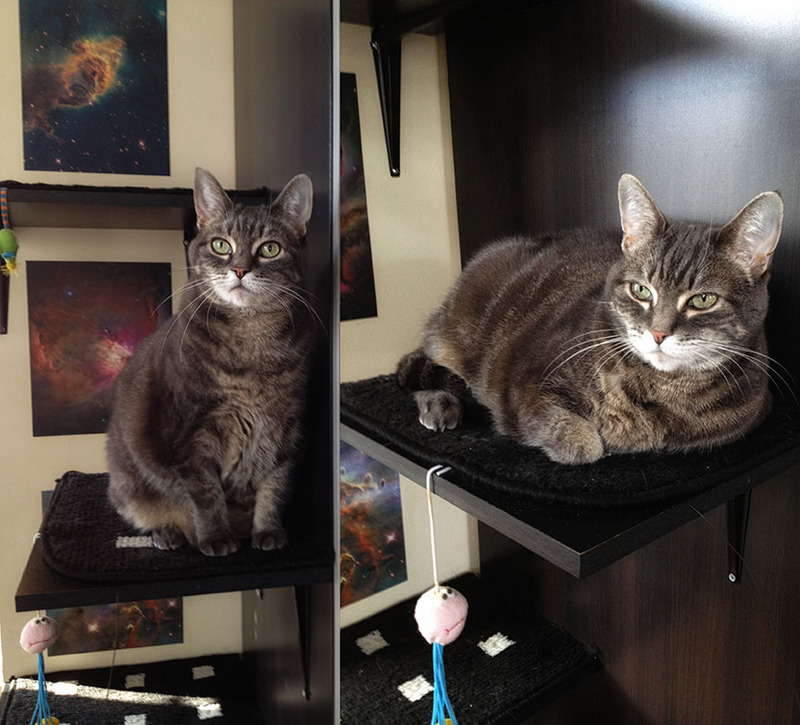 I prefer the third shelf from the bottom – a great view of the bedroom and a quick escape, should one be required. I LOVE CATS and I love Nora !!!!!! Nora’s Twin? And She Lives In Pennsylvania, Too. Yes. I have a Petcube Camera, too.